In this dream I was wandering about, crying and praying very hard due to the deep darkness enveloping everything around. The darkness was so dense I could barely see, but heard people crying and calling out to God in much distress and perplexity. Like me they were wailing, “How long is this going to last?” Then I saw many souls rise up from the ground with their arms lifted upwards as they flew away into the sky. 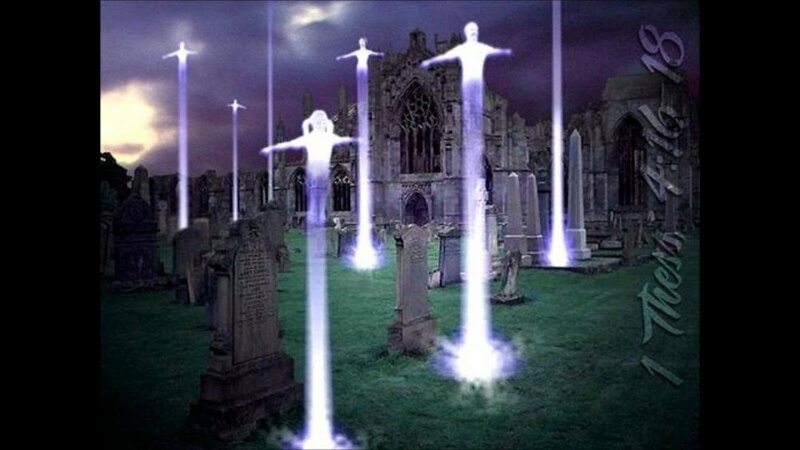 Their forms were all white, what we often refer to as ‘ghosts’ which are the spirits of people who have died. In the dream an angel put an all white gown or tunic on me and told me to wait for the others. There the dream ended or that’s all I remembered when I woke up. 1Th 4:15 – 17, For this we say to you by the word of the Lord, that we who are alive and remain to the coming of the Lord shall not precede them who are asleep. For the Lord himself will descend from heaven with a shout, with the voice of an archangel, and with the trumpet of God: and the dead in Christ shall rise first: Then we who are alive and remain shall be caught up together with them in the clouds, to meet the Lord in the air: and so shall we ever be with the Lord. Do you see it? The “dead in Christ” arise FIRST, THEN those in Christ who are alive when He appears. The First Resurrection (of the Just) and the Rapture of the living saints happen simultaneously, meaning one right after the other, or at least there’s a very short time lapse between these two events. How wonderful it is to be a blood-bought child of God; those who put their trust in God, live according to His Word, and have been “washed in the Blood of the Lamb (Jesus)” have a glorious future in His Eternal Kingdom. How terrifying and awful it will be for those who refuse Christ’s gracious offer of Salvation and as a result will be cast into the blazing furnace of Hell – Rev 20:15 And whoever was not found written in the book of life was cast into the lake of fire. Related Scriptures – Luke 21:25 And there shall be signs in the sun, and in the moon, and in the stars; and upon the earth distress of nations, with perplexity; the sea and the waves roaring; Luke 21:26 Men’s hearts failing them for fear, and for apprehension of those things which are coming on the earth: for the powers of heaven shall be shaken. God means every word He’s ever spoken! Now is the only time you have to choose where you’ll be spending eternity. “Choose Life, not death,” said Yahweh. Obey God’s laws and make Jesus your Lord and savior – today! You must be Born Again to be a child of God. For more information on how to be Born Again (born of God’s Spirit) read John 3:3 & 7, and 1 Peter 1:23 to get understanding. You may also write me at soareeng.eagle@gmail.com and I’ll be happy to answer any questions re this process, and or guide you through it.